Hey, I’m Nicole Wilder, also known as the Mommy Trainer. I’m a pre/post-natal fitness specialist and head trainer here at IdealRaw. Aside from that, I’m also a happy mom to three young and busy boys. And they sure do keep me on my toes! I love being a mom and wouldn’t trade it for the world, but just like you grown ups know, a life of an adult can be stressful! It can be really hard to combat all of that stress that comes from our many responsibilities. Work, school, kids, money. All of it comes with some form of stress, and as it builds and builds, I definitely find that it affects me — and not in a good way. It messes with my sleep, it plays with my mood, and it causes me other health issues that stress me out even more! That’s why IdealRaw Calm is a game changer for me. With its high quality blend of herbs, extracts, amino acids, and minerals, it was specifically designed to help you and me relax from the day to day stresses of life. Whether you’re a runaround mom of three like me, or just need something to pick you up from a stressful day, IdealRaw Calm natural stress relief supplement is there to help. Need a Breather but Don’t Have the Time to Spare? Day after day, week after week, we all deal with our fair share of stress. It’s just a part of life. Unfortunately for us, though, stress can add up over time and actually take a toll on our bodies and our health. It can negatively affect our sleep, our weight, and our overall mood. Simply put, IdealRaw Calm changes all of that. Feel free to go with the flow, because IdealRaw Calm stress relief supplements will be there to keep you calm and collected. If a little less stress is what you need, a little more Calm is just a bottle cap away. Save on IdealRaw Calm Today! Can I view the nutrition facts and ingredients list? 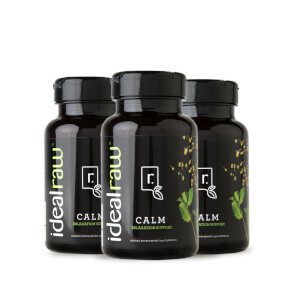 How many servings are in a bottle of IdealRaw Calm? Will IdealRaw Calm put me to sleep? IdealRaw Calm is a blend of natural ingredients meant to support relaxation. This product can aid in promoting a healthy night’s sleep. When should I take IdealRaw Calm? Daytime for focused relaxation, or nighttime for a better night’s sleep. Can I take IdealRaw Calm in the morning? Yes, this is a great time to take it. This will provide a good focus and relaxation throughout the day. 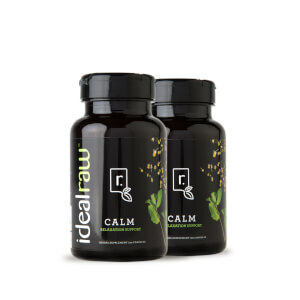 Can I take IdealRaw Calm if I'm pregnant? We advise discussing any supplement with your doctor. Can I give IdealRaw Calm to my kids? We do not advise IdealRaw Calm for anyone under 18. We are sure you'll love IdealRaw Calm. If you don’t, send it back within 1 year for a full product price refund. No hassle and no questions asked. It's that simple!